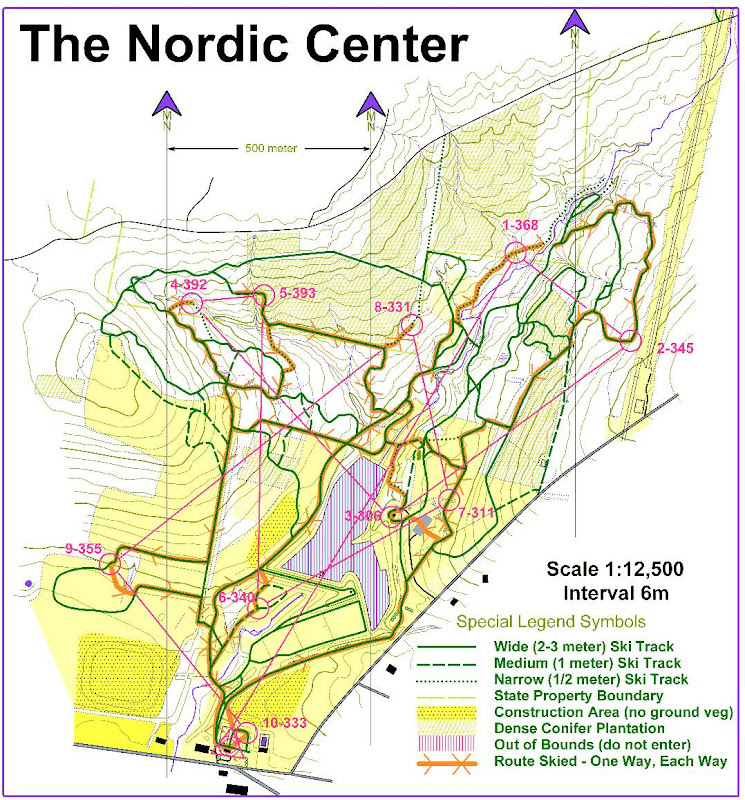 The two late January races at The Nordic Center (Virgil), and Sherrill Brook Park (New Hartford), encapsulated the two extremes of the Ski-Orienteering experience in New York. The first venue is an XC Center, in a very rural area. The second is a public Park, on the edges of suburbia. It is no negative reflection on either Meet Director to say that the first presented the pure combination of the skiing/navigation challenge which Ski-O aspires to, and the second offered the opportunity to test your ability to negotiate marginal conditions, and keep your wits while trying to survive. My survival story will have to await another time and more space, but here is how I handled one of the better courses I've been on over the last few years. On that Saturday the conditions at The Nordic Center were just about perfect. I and my family arrived a bit before Noon, and the temperature was in the low 20's, there had been another recent dusting of snow, and the main trails were (as usual) all groomed wide for skating and speed. Of course, several of them went straight up into the clouds, but we were still really excited about getting our first crack at some great skiing over what we knew would be a challenging set of courses. Getting ready to go off near the middle of the Start window, we knew we wouldn't be the first out on the course, and that some others would be chasing us, which gave us some targets and "must to avoids"; and shortly after Noon, we were all off on our courses. The Female Open and Masters, and the Scholastic Males, all competed on the same course (the Medium distance), so my son Marty was really pumped at having a shot at beating Mom (my wife, Sue). I watched them both head out, cheered each on to have a great race, and continued getting myself ready to go. I'm a bit slower than they are in preparation. This is partly because I often need to help each of them with things like getting their map holders on, or pinning the punchcards to some piece of clothing or equipment strap, and also because I like a few moments completely to myself, to focus my thoughts and mentally prepare for the upcoming challenge. When I was ready to go, there had been no starter on my own course (the Long one, since both Open and Masters Males were competing on it, as is the general rule) for several minutes, so I didn't have to wait at all. I got my map, was told I still had 50 seconds, got it folded and into the map holder (with my gloves still on), searched for the Start triangle and the first Control point while feeling to get my pole straps back on properly, settled on the direction to start out, and BANG! Off I went. While it's possible to get confused right out of the box at any race, and certainly the Nordic Center offers a number of options for leaving the Start area, the first Control on the Long course didn't involve any tricky and irrecoverable route choices right away. You just needed to stay left until the second junction after the stream crossing. Then it was up a bit of hill and keep heading Northeast until after the next stream and you started coming down again. Then you could take either the Left or Middle trail and jog to the narrow track to the Control. I was skating because most of the tracks there are Wide, but that makes all the Narrow and even Medium tracks somewhat difficult. When I reached the Narrow trail in to the Control I could only double pole, and it sure seemed like there were more uphill moments than were shown on the map. But eventually I got there, and I at least had the satisfaction of knowing I had gotten there as directly as I could. One of the things you try to do in any orienteering event, on skis or on foot, is to mentally set up the next Control while you physically finish getting to the one you are on. Having had a long slug to #1, I had plenty of time to decide how I would head out to #2. And this was where the course setter had started to present us with significant choices. There was no clear direct route to #2. The trails all went NE-SW, and I needed to go SE. The choice quickly broke down to heading out NE and looking for a stream crossing and then bushwhacking up to the trails, or skiing SW to use the bridges and trails without having to remove and reaffix your skis. From the flag at #1, a look to the NE showed that at least someone ahead of me had tried going that way. I decided that the risks of the stream crossing were lower than the distance penalty I could see in taking the bridge route, so I started NE. A major part of my decision process was that I knew the temperature was only in the low 20's. A few years back, I had made a similar decision at the Nordic Center but had not considered the temperature, which was around zero. I leapt across a stream but got one of my boots into the edge of the streambed, and ended up spending 20 minutes trying to get the resulting ice out of the tracks on the bottom of my ski boots before I could get them back into my skis. My leap wasn't a whole lot better this time, but the results were not so catastrophic, as I could still get my skis back on fairly soon. This just left a hard slug up some 60 meters of climb to the Control. Fortunately the other advantage to this route choice was that the climb was spread out a bit more than if I had taken the bridges. And as a result, when I was approaching the flag I could see two of my competitors up ahead punching in, so I knew I was gaining on them. The immediate route out from #2 to #3 was self-evident, but it quickly became more complex. There were several choices on which trail to use to drop down to the level of the Control, and some junction points involved four, five or even six trails. I decided to stay above the complexities and avoid the medium and narrow trails, but something went wrong. I can't recreate exactly what I did, but after negotiating the first steep downhill from the flag, which by the time I went through involved high speed steps over out-cropping roots and rocks since much snow had been scraped off by my predecessors, I hung a hard left and flew past four mostly downhill right turns. Then I took the fifth right, and the next left, and then somehow I lost it. I was out in the open now, and I knew, because I had at least kept my mind somewhat on my map, that what I was looking for was a Building. I spotted one back to my right and began to look for a trail heading that way. After another thirty seconds or so of skiing on and not seeing anything going where I wanted, I just turned right off the trail and pointed myself back downhill towards the building. I double poled until I hit another trail and then skated on in to the flag. I was sure I had lost some time, but as I left I saw one of racers I had seen ahead of me at the last Control still hesitantly coming in over the Medium track (because he couldn't see the flag from there), so I knew I had actually gained time on some of my competition. Control #4 wasn't too complex, but it was the most physically challenging one on the course. Coming out of #3 you had to (unless you were stupid) take either the Narrow or Medium track N, then get over the bridge and slug up the most climb of the day, another 60 or 70 meters. The bridge crossing was out-and-out dangerous. You dropped 15-20 meters on a very scraped-off track targeting a bridge only half a meter wide. Missing big was much better than almost making it because you'd really wreck yourself if you split one of the handrail posts at the end of the bridge. After dodging a skier trying to negotiate the uphill, I just managed to pull my right leg in as I reached the bridge and glided over it, turning left at the T and pushing on for the Big Grunt. It seemed clear to me that I wanted the straight uphill rather than the winding one. Unlike going to #2, the more circuitous route didn't really stretch out the climb enough to be worth the extra distance; and while I would have to head back N once I reached the top, that would be truly flat, and I was sure I would appreciate it once I got there. My tougher choice was which end of the Narrow trail to enter to get to the Control. I decided to avoid more hard double poling by skating up to the NW end and then dropping down the ten meters to the Control. Getting to #5 presented a classic Ski-O choice: ski around or drop the skis and bushwhack. I had decided to make that choice on the basis of how it seemed as I schussed in to #4. Having done that, I knew I did not want to try fighting my way back up to the skating trails to go around. After punching my card, I popped off my skis, checked my compass, and headed ENE through the knee-deep snow. To simplify these moments I've developed the habit of ignoring my poles, and just letting them drag from their straps as I concentrate on my footsteps and holding onto my skis. This time the distance felt longer than I was expecting from the map, but after first managing to get across another stream uneventfully, I saw some skiers up ahead on what had to be a trail, headed for it, and found my self coming out just a few meters from a Control. I was about to punch my card when I realized the number on it was not the Control Code I was looking for. Since I had been aiming off to the left (W), I knew I needed to go further E to reach the Control I wanted. And indeed, after getting my skis back on and skating just a few seconds I could see the flag I had been going for all this time. The Nordic Center isn't a particularly large area, so to have the courses reach appropriate distances, there was bound to be some crisscrossing and retracing of tracks. Control #6 took us almost back at the Start point, but there were two new and significant choices in how to get there. First, how to get down from the heights we were on, and second how to approach the Control. I decide to avoid the Narrow track immediately S, and go E on the Wide skating trail. I thought this looked only slightly longer while allowing me to maximize my speed. From there I went to the Wide trail corner directly N of Control #6, and dropped down the 15 meters to the Medium track paralleling but not in the tracks of a couple of earlier skiers, which afforded me more control as I made the steep descent. As I came in I was deciding one of the toughest route choices of the race. While seemingly frozen over, the Central pond had been declared out of bounds right at the Registration tent, so the question was how to get around it to reach #7. Here I may have succumbed to some simple weariness, but I just didn't think it was a good idea to have to take my skis off and bushwhack once again, which would have been required to exit back up the steep 15 meters either to the N or the E. So, I skied off SW, going all the way around everything. Fortunately I never missed a turn, so in the end I suspect I lost no time. Getting to #8 was rather a repeat of balancing the factors involved in getting #4, but it required a different solution. This time after crossing the bridge (and once again I just made it), I turned Right at the T, then Left, then Right up the hill, and Right again onto the Narrow track. The map again doesn't do justice to the ups and downs I had to cover in double pole mode, but I made it, punched, and then headed directly back out over the same track. At the junction I made perhaps my most difficult choice. At this point in the race I was very tired. I hadn't seen any of my known competitors in quite awhile, but who knew where they were, and I was still trying to push myself. On close inspection of the map, Control #9 was clearly around the hill. How could I avoid losing the altitude I had expended so much energy to gain? I had previously avoided the Narrow trail S of #5, but my experience in doing that told me it really was pretty flat from there to the E, and most of the Narrow trail was downhill or flat, which would leave me still above #9. So, I went that way: W to the Narrow trail, then S to the E-W trail for the 15 meters of climb I would still have to do, and then speeding S downhill. I looked at the bushwhack possibilities as I zipped down, but the weeds coming up through the snow looked like they would make it slower than going around to the groomed trail which led into the Control. Coming into #9 I had planned to look for any tracks leading out, and sure enough there were some heading in the direction I wanted to go, SE. The trick was getting below the vegetation line and across the stream bed. The first was visually obvious from the beginning, and the second became obvious as I approached. I could see a still solid "snow bridge" which hadn't yet been broken by another skier, got across it, and rejoined the trail just where it bent back E again. From there my only thought was "Don't Mess Up!" because I thought I had the path into the Finish pretty clear in my mind. After getting through the intermediate junctions correctly I did have a moment's pause as I could not see the last Control where I expected it to be, but I went on, found it lying flat in the snow, punched my card, and did a last bushwhack skating on top of the ungroomed snow straight across to the Finish line. Afterwards I was exhausted but exhilarated that I had once again managed to overcome all the choices, creations, and challenges that had been set up for me. I actually beat all the others in the "Old Fogey Males" category, and some of the "Young Vibrant Males" as well. Sue and Marty also had good races, and we and everyone spent quite awhile going over our courses and routes together. After chit-chatting for awhile, some of the other competitors suggested we go out for some additional skiing, since it really was such good skiing out there. But here I decided to let age provide me with an out, and I declined. After all, this aging body, or at least its brain, was planning on racing again the next day only(!) a hundred or so miles away, just to make it a complete weekend. Much thanks go to Pete Dady and all his CNYO helpers, and particularly Mark (and Barb) Dominie, who run the Nordic Center and produced the maps. When you do it again, we'll be back.